Whether we were soaring through the air being pushed by someone or pumping our legs as hard as we could so we could go higher and higher, swinging is something that many of us loved doing as a child! If you’d love to have a swing in your yard for your child but don’t have a lot of room, our list of the best swing sets for small yards gives you lots of great options. Any one of these swings will give your child hours of outdoor fun and excitement. But swinging outdoors is more than just a fun way for kids of all ages to pass the time. It also provides your child with some wonderful developmental benefits. Physical exercise, increased socialization, less screen time, improved balance and focus, and increased spatial awareness are just some of the many benefits your child will get from swinging. This calming activity is also a great way to improve your child’s sensory integration, which is how their brain organizes and interprets what’s going on around them. Aside from all these wonderful developmental benefits, swinging will also give them some awesome childhood memories. Just like the ones we have from all those hours spent flying through the air on a swing when we were kids. So let’s get them off their devices, outside in the fresh air, and swinging to their heart’s content! Your child will have tons of fun as they soar safely through the air in the awesome Step2 Infant to Toddler Swing Seat! Comfortable for your child and easy for you to get them into and out of, this seat is ideal for kids 9 months to 3 years old. The restraint bar holds them securely in place and the seat is designed with a slight dip in the center to prevent your little one from leaning too far forward. The weather resistant rope is included with the swing and the seat is really easy to clean. 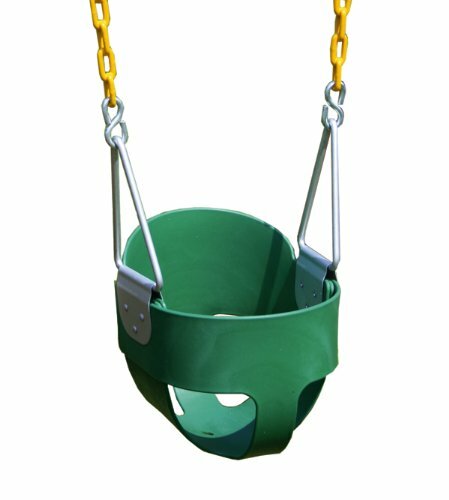 Made in the USA, this Step2 swing seat has a 50 pound weight limit and can be hung from a swing set, a beam or tree branch. It can also be attached to the Step2 Playhouse Climber, Swing Extension, and Adventure Lodge Play Center, all sold separately. This fun swing seat is worth considering if you’re looking for an outdoor toy that will be lots of fun for both your child and you! Kids love swinging in it! 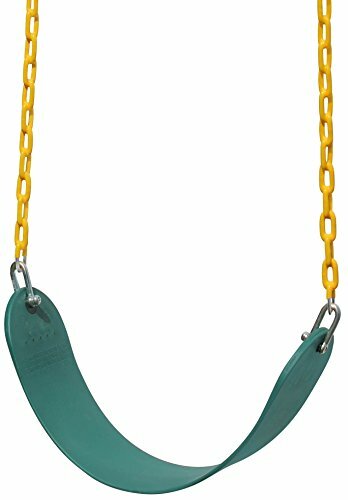 This Jungle Gym Kingdom Swing Seat With Heavy Duty Chain is a great sling style swing seat like you see on commercial swing sets at parks and playgrounds. Easily conforming to anyone’s body shape, the seat itself is 26 3/4″ long by 5.5″ wide and made of copolymer plastic. And the attached 66 inch chain is coated with a special material that ensures it won’t pinch your child’s fingers. 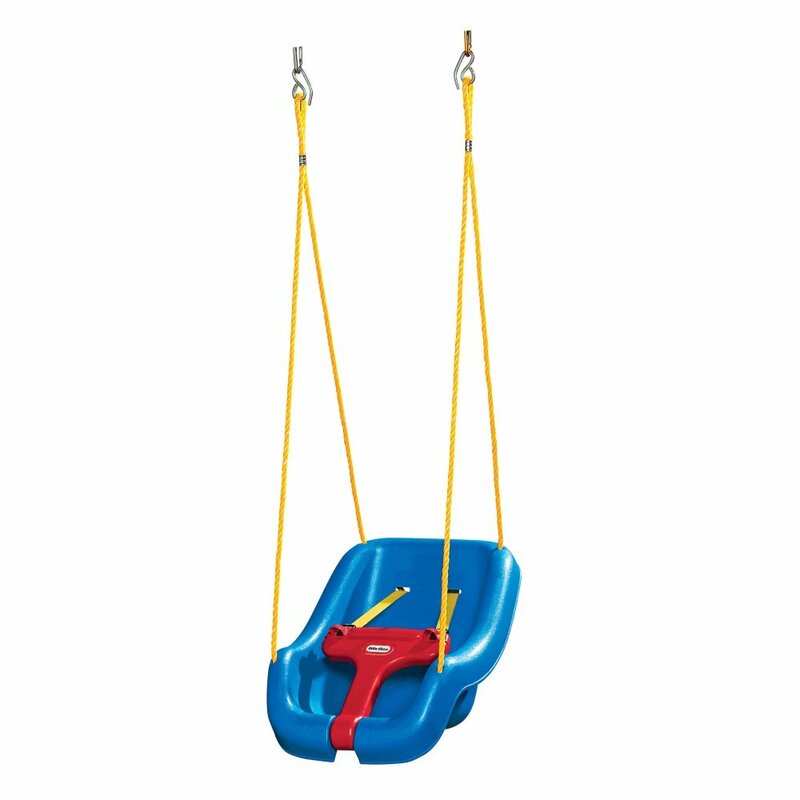 This swing can be added to any existing swing set as a replacement swing or can be attached to tree limb or a beam. It should be noted that it comes with is carabiners, so depending on how you plan to hang it, you may have to purchase additional hardware (sold separately). Designed for children ages 3 years and up, this swing seat has a weight capacity of about 250 pounds which makes it suitable for kids and adults. If you’re looking to add or replace a swing seat or simply want a swing seat to hang from a tree branch or beam, this Jungle Gym Kingdom Swing Seat is a great option! 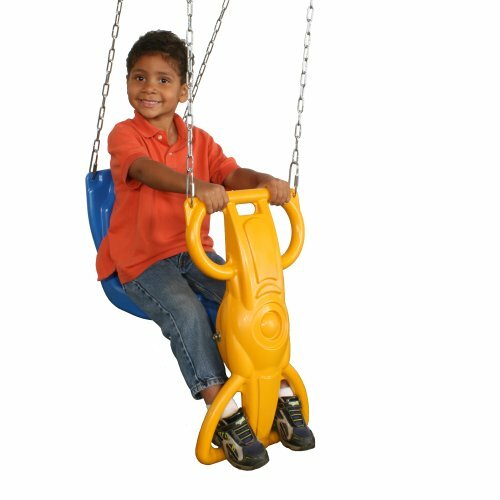 With this awesome 27 inch Super Spinner Swing, your child will have tons of fun swinging, spinning, or doing both at once! The seat measures 27″ X 27″ X 4″ and is made from polypropylene. It also has a hole in the center that allows moisture to drain off of it. 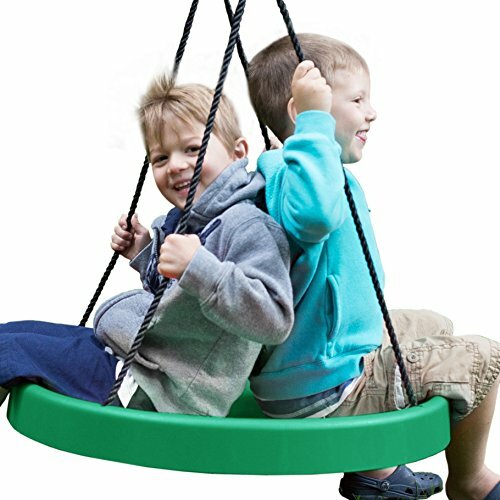 This swing has a plastic rope weld comes with a 10 foot hanging kit, is designed for children ages 3 years and up, and comes with a 2 year warranty. This fun swing operates like a swing and the rope can be twisted to set the swing spinning, with is great fun for kids of all ages. 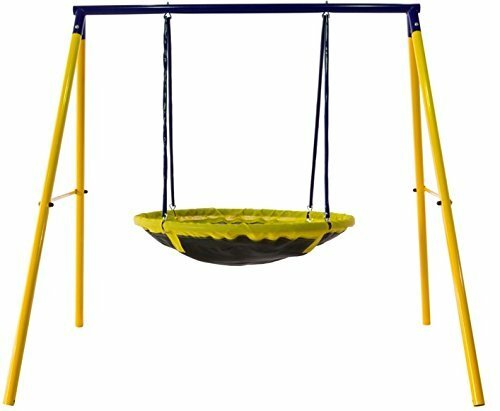 Designed for up to 2 riders, this awesome spinner swing holds a maximum capacity of 200 lbs, so it’s great for adults too. The Super Spinner Swing is a great small yard swing set that will provide your child with hours of entertainment and exercise on those long summer days. The Eastern Jungle Gym Heavy-Duty High Back Full Bucket Toddler Swing Seat allows you to swing your infant safely while they have lots of fun! The seat itself is made of heavy duty polymer plastic. It measures 11.5″ from front to back, and is 10″ wide. The rust resistant chain is 66″ long and can be adjusted up to a 9 foot swing beam. The bottom 30″ of the chain is coated in plactisol, a soft and flexible material that helps prevent tiny fingers from being pinched. Recommended for kids 1 to 5 years of age, this full bucket toddler swing seat comes fully assembled. It can be attached to an existing swing, a tree branch or a beam, but it doesn’t come with any hanging hardware so that will have to be purchased separately. If you’re looking for a safe, long lasting infant/toddler swing seat, this Eastern Jungle Gym High Back Full Bucket Toddler Seat is well worth considering. Your child will have tons of fun as they surf through the air on the one-of-a-kind Swurfer Original Tree Swing With Skateboard Seat! This awesome swinging surfboard has a seat that’s designed like a skateboard, and kids love it because it feels like they’re surfing on air instead of in the water. The curved shape of the seat is engineered for maximum power, stability, and range of motion. And the best thing about the Swurfer is that the types of motion are almost endless! Your child can swing side to side, forward and backward, in an oval, in circles, and lots more. The only limit is their imagination. Kids can sit and swing on the Swurfer or they can stand and surf through the air while performing cool tricks. It’s an ideal way to improve their balance, build their overall body strength, and boost their confidence. 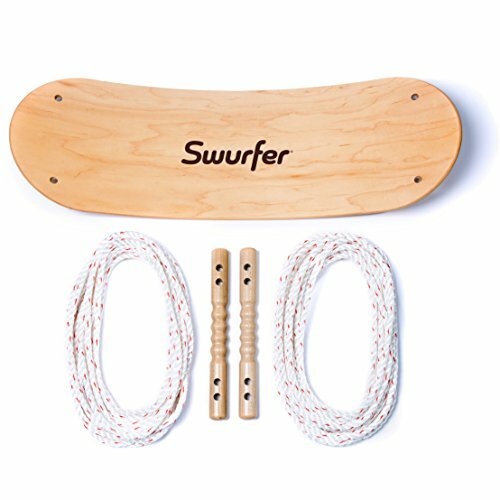 Made in the USA, the Swurfer comes with a maple wood seat that has a UV and water resistant finish, two 30 ft long extra strong ropes, and two adjustable handles. The Swurfer comes with everything you need to hang it from a tree, which means you can have it up and your child can be swurfin’ in no time flat. Because it’s a more advanced type of tree swing, the recommended age is 6+. And with a maximum weight limit of 250 lbs, adults can join in the fun too! The award winning Swurfer Original Tree Swing is an awesome swing for older kids who have a sense of adventure and are looking for some unique backyard fun. If your child loves board sports or thinks that a regular swing or spinner swing is a bit too tame, the Swurfer is an excellent alternative for them! 250 lb weight limit so the whole family can get in on the fun! The Jump Power UFO Swing Set is an awesome backyard swing that’s sure to give your child hours of outdoor fun! Designed to hold 2 kids at once, this UFO Swing Set measures 84″ X 69″ X 73″ and has heavy duty galvanized steel tubing and frame. It has an adjustable PVC chain that’s coated to for safety, ensuring your child doesn’t get their fingers pinched. This swing set is safe and well made so it will last for years. And kids love that it’s shaped like a UFO and they can either lie down or sit up on the seat. Ideal for children ages 3 to 8, this swing will hold a maximum of 110 lbs and is a great swing set for a small yard. This UFO Swing Set makes a great addition to any backyard play area. The Wind Rider Glider Swing is a unique type of swing that your child will have lots of fun on! This single child glider is designed to allow younger children to swing themselves without needing anyone to push them. It’s easy for your child to start, speed up, slow down, or stop, and all they have to do to keep the glider moving is lean forward and back with their body. The comfortable seat offers some nice sturdy back support for your child and it has hand grips and foot holds. This Wind Rider Glider is easy to assemble but it doesn’t come with any hardware. The included chains will attach to any standard swing hangers so if you’re hanging it where you already have hooks, you’ll be OK. If not, you’ll have to purchase the hardware you’ll need (sold separately). This glider swing is a great way to improve your child’s coordination and strength and it’s a great addition to any backyard. It also helps younger children make the transition from a toddler swing to a regular swing. Kids think the gliding motion is lots of fun! 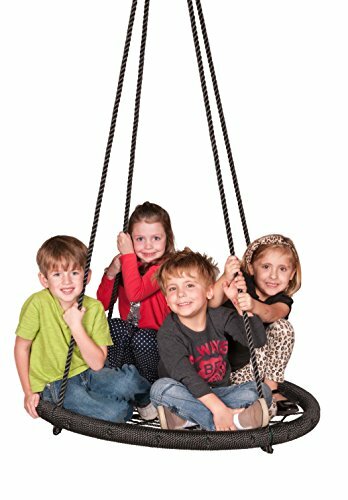 The Web Riderz Outdoor Swing N’ Spin is a hammock meets swing meets merry-go-round that’s tons of fun! This netted swing is really versatile and your child will love all the ways they can swing on it. They can sit, stand, kneel, lie on their stomach, or lie on their back. And in addition to the traditional back and forth swinging motion, this swing can also go side to side and around in a large circle. But what kids love most of all about this awesome Web Riderz Swing is the thrill they get from the spinning motion! You just wind it up and let them spin round and round. The woven platform seat has a diameter of 39″ and is made from UV-resistant polyethylene rope with a steel tube powder-coated frame. The included adjustable hanging ropes are made from the same UV-resistant polyethylene, ensuring this swing will last for years. It can be hung from a playground set or a tree and is designed to be attached from one point or two points. It comes fully assembled but doesn’t come with any hanging hardware, so depending on where you want to hang it, you may need to purchase hardware (sold separately). The Swing N’ Spin is an ideal swing for a small back yard and it holds up to 600 lbs so the whole family can join in the fun. It’s recommended for kids 5+ and because there are so many ways your child can swing on it, this fantastic backyard toy is one they won’t tire of easily! Kids love all the ways they can swing on it! 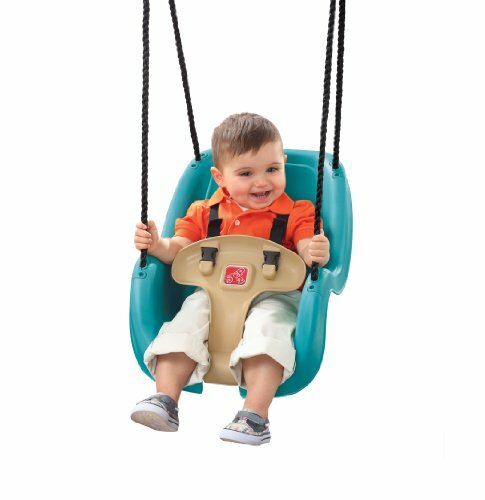 The Little Tikes 2-in-1 Snug ‘n Secure Swing is a nice little swing that your infant or small toddler will love swinging in! Designed to grow with your child from baby to toddler, this outdoor swing has some great features. The T-bar holds your baby safely in place and rotates down so you can easily load and unload you child. When your child gets bigger and no longer needs the T-bar, it can be removed. At that point, if your toddler still needs to be secured into the swing, you can use the adjustable shoulder straps. If not, the shoulder straps also easily move out of the way. A lot of parents love that the shoulder strap buckles have covers that can only be accessed from the bottom. This is a great safety feature that prevents your toddler from unbuckling themselves. It can be hung from an existing swing set or tree branch and comes with heavy duty hanging ropes. There’s a large S-clip on the end of each rope, but depending on where you’re hanging it, you may need other hardware (sold separately). Made in the USA, this Little Tikes swing has a maximum weight limit of 50 lbs. It’s a great little swing that grows with your child and will provide them with years of outdoor fun!